ARC has agreed to collaborate with NB Power to work on the future deployment of the ARC-100 at NB Power’s Point Lepreau nuclear plant site and thereafter at other sites in Canada and worldwide. The ARC-100 is a 100 MWe sodium cooled, fast flux, pool type reactor with metallic fuel that is based on the 30 year successful operation of the EBR-II reactor in Idaho. ARC was formed to bring back and commercialize a technically mature, advanced reactor technology that was created and proven by a U.S. prototype reactor that ran successfully in the United States for 30 years which is the Integral Fast Reactor (IFR) which was developed at the Argonne West field station on the Arco Desert 27 miles west of Idaho Falls, ID. ARC has made significant proprietary advances to the original EBR-II design in order to create the ARC-100. The ARC-100 design creates a “walk away” passive safety system that insures the reactor will never melt down even in a disaster that causes a complete loss of power to the plant site. In addition, it can be fueled with the nuclear waste produced by traditional reactors, and its 20 year refueling cycle offers new levels of proliferation resistance. The firm applied for a Phase 1 Review with the Canadian Nuclear Safety Commission in Fall 2017. According to the company, the ARC-100 has the following competitive factors. Small Size – Small enough that its modularized components can be shipped and installed at the site using regular commercial equipment, such as barges, rail, trucks, and construction cranes. Sodium as Coolant – The use of sodium instead of water as the heat transfer agent in the reactor allows the reactor to operate at ambient pressure. Its containment vessel is a double walled stainless steel tank rather than a 12 inch thick forged steel containment vessel required for traditional light water reactors. Passive Safety – Effectively “walk away” fail safe and protection of the reactor from a melt down does not depend on extra pumps, operator intervention or any external system in the event a disaster destroys all electric power to the plant site. Re-use of Nuclear Waste – The ARC-100 can be used to recycle traditional nuclear waste and generate energy, burn or transform plutonium that could be used for weapons and eliminate the need to bury or store large quantities of nuclear waste. Twenty Year Refueling Cycle – The proprietary reactor core of the ARC reactor is designed to operate for 20+ years without refueling. It also provides a new model for nuclear power that is based on factory fabrication of modular components that can be shipped for rapid site assembly, thereby promoting the prompt start of a revenue stream. A key objective is the establishment of Canada’s New Brunswick Province as a center of excellence and the manufacturing hub for advanced SMR products based on the ARC-100 technology. The project will result in a nuclear supply chain created in the Province with well-paying jobs and substantial new economic opportunity. “We are pleased to announce the participation of ARC, a company with significant experience and ability to make advancements in this bourgeoning sector,” said David Campbell, chair of the New Brunswick Energy Solutions Corporation. The New Brunswick Energy Solutions Corporation is a joint venture formed in May 2017 by New Brunswick’s provincial government and NB Power, operator of the Point Lepreau nuclear power plant, to explore energy export opportunities. The Point Lepreau site is home to a 705 MW Candu-6 nuclear reactor. In 2013 the utility spent over USD$3 billion refurbishing the reactor nearly $1 billion more than budgeted for the project. It was the first of a kind project for a Candu-6. The provincial government sued AECL for the cost overrun. It’s clear that from this experience the utility has no interest in ever building another full size reactor at the site. ARC will be supported by its partner, GE Hitachi Nuclear Energy (GEH), in line with their previous announcement of collaboration. The company last year signed an agreement with GE Hitachi Nuclear Energy (GEH) to collaborate on development and licensing, and uses proprietary technology from GEH’s PRISM reactor. GEH has broad engineering experience, deep technical capability, and significant investment in its sodium fast reactor technology program. The ARC Nuclear team brings decades of sodium fast reactor experience to this effort. By working together, ARC and GEH have been working to accelerate commercialization of this technology. In addition, GE has deep experience in supporting the development of energy supply chains worldwide, and GE Canada has a strong presence with over 6,500 employees and over 125 years of operations and Canada. “We have been collaborating with ARC for more than a year and are bringing intellectual property, engineering tools and experts, rigorous quality programs, and management systems and processes, all of which are necessary for nuclear development,” said Jon Ball, Executive Vice President, Nuclear Plant Projects, GEH. “ARC was formed to bring back and commercialize a technically mature, advanced reactor technology that was created and proven by a U.S. prototype reactor that ran successfully in the United States for 30 years,” said Don Wolf, CEO and chairman of ARC. World Nuclear News reported the announcement follows the government of New Brunswick’s commitment of CAD10 million (USD7.5 million), announced on 6/26/18 to help the New Brunswick Energy Solutions Corporation develop a nuclear research cluster in the province, which is home to the Point Lepreau nuclear power plant. ARC will commit CAD5 million to operations and research in New Brunswick, and establish an office in St John. The move aims to position New Brunswick as a leader in the field of research and development of small modular reactor (SMR) technology. National nuclear science and technology organization Canadian Nuclear Laboratories has set a goal of siting a new SMR on its Chalk River site by 2026. Canadian company Terrestrial Energy in June last year began a feasibility study for the siting of the first commercial Integrated Molten Salt Reactor at Chalk River. The Canadian Nuclear Safety Commission is currently involved in pre-licensing vendor design reviews for ten small reactors with capacities in the range of 3-300 MWe. Natural Resources Canada earlier this year launched a process to prepare a roadmap to explore the potential of on- and off-grid applications for SMR technology, aiming to position the country to become a global leader in the emerging SMR market. The New Brunswick Energy Solutions Corporation has announced the participation of Moltex Energy in the nuclear research cluster that will work on research and development on small modular reactor technology. It is the second SMR announcement this month for the Point Lepreau nuclear power station. Just weeks after its success in being selected as a winner in the UK government’s Advanced Modular Reactors competition, Moltex announced that it has also been selected by New Brunswick Energy Solutions Corporation and New Brunswick Power to progress development of its SSR-W (Stable Salt Reactor – Wasteburner) technology in New Brunswick, with the aim of deploying its first SSR-W at the Point Lepreau nuclear reactor site before 2030. Moltex will commit $5 million to operations and research in New Brunswick and establish an office in Saint John. The provincial government recently announced a commitment of $10 million towards the nuclear research cluster. “This represents the second significant private sector partner in nuclear technology, research and potential development to join the recently established nuclear research cluster at the University of New Brunswick,” said NB Power president and CEO Gaëtan Thomas. The selection of the Moltex technology reflects its advantages. (Technical briefing – PDF file) See also this description of the molten salt technology. 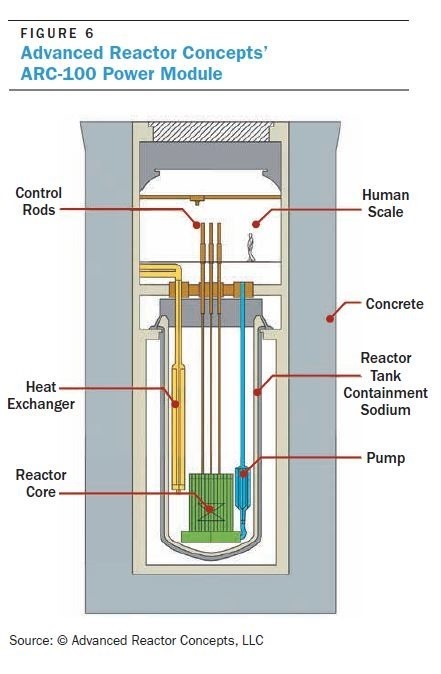 Cut Away Diagram of Moltex Reactor. Image: Moltext Corp. According the World Nuclear News, Moltex Energy’s SSR is a conceptual UK reactor design with no pumps and relies on convection from static vertical fuel tubes in the core to convey heat to the steam generators. A key element of the design is that fuel assemblies are arranged at the center of a tank half-filled with the coolant salt which transfers heat away from the fuel assemblies to the peripheral steam generators, essentially by convection. Core temperature is 500-600°C, at atmospheric pressure. Moltex has also developed its GridReserve molten salt heat storage concept to enable the reactor to supplement intermittent renewables. See this technical review of molten salt reactors which explains how the concept work. Moltex has submitted both fast and thermal versions in the UK competition for SMR designs, and has applied for Phase 1 of the Vendor Design Review with the Canadian Nuclear Safety Commission (CNSC). Up to eight modules can work together for up to 1200 MW. The long-term vision for Moltex is to build a commercial demonstration small modular reactor plant at the Point Lepreau Nuclear Generating Station. Additionally, new advancements in energy generation, such as small modular reactors, are meant to complement the gains and partnerships being made through the province’s smart grid initiatives.